In the Burt-Stark Mansion the War between the States finally came to an end. Here, on May 2, 1865, Confederate President Jefferson Davis, in retreat but still fighting, held the last council of the war of the Confederacy. 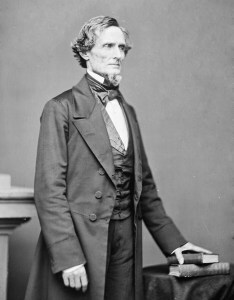 Present were cabinet members Benjamin, Mallory, Reagan and Breckinridge and five Brigade Commanders, Ferguson, Dibrell, Vaughn, Duke, and Breckinridge. Here, Davis was convinced by his generals and cabinet that the Southern resources were exhausted and that any attempt to fight another campaign would merely bring more misery to the region. Built in the 1830s by David Lesley, planter, lawyer, and Abbeville District judge, the Burt-Stark Mansion is in the Greek Revival style. It is furnished with Southern antiques including furniture, silver, crystal, rugs, and paintings. The gracious dining room with its plantation hunt board recalls the hospitality for which the house — and indeed the entire South — has always been known. Catching the sunlight as you enter the house is the rare stained glass crescent transom which connects the front and rear hallways. The transom was designed by Martha Calhoun Burt in honor of her French Hugenot heritage. Believing that the Burt-Stark Mansion possessed significance in the history of the United States, Mary Stark Davis, the last surviving member of the family who bought the house in 1900, donated her historic home and its contents to the Abbeville County Historic Preservation Commission so as to preserve it for future generations. The Burt-Stark Mansion stands as a silent witness to some of the most pivotal moments in the tumultuous history of the War Between the States. Those moments deserve our consideration. Read all you can read, but take the time to experience the Mansion firsthand.